I've had this this fabric sitting in my stash since Christmas vacation, when I picked them out after quilting high. Well when I got home, those fabrics and pattern promptly went into the stash pile where they sat. and sat. and sat. I finally finished up this quilt top over our long summer vacation in California. but again, the finished top just sat and sat. Until a couple days ago, when I decided I needed to buy a backing for it and get it done. I love the way it turned out. I was worried it would be too bright, but the white and the blue background seem to have toned it down quite a bit. I used another Cluck, Cluck, Sew pattern for this one. I just adore her patterns. They are so easy to follow. 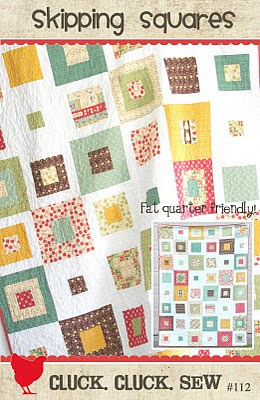 If you are thinking about quilting, I would definitely recommend her patterns for a beginner. Here is the pattern I used, it's called Skipping Squares. It takes 10 fat quarters and some white yardage. If you have budget constraints, this is also another good one, as you can usually get fat quarters on sale and you can buy white yardage for cheap at Wal-Mart. While I love the way this quilt turned out, it was A LOT of cutting. A Lot! Which is why I think it took me so long to finish, cutting is my least favorite part. But putting the pieces together was very simple and the instructions were easy to follow. With this quilt I also tried stippling, which is basically squiggly lines that don't touch or cross over each other. It was a little more time intensive then my regular random curly-Q's, but I really like the finished look. And it makes the back look really neat. I didn't have a purpose for this quilt, so I'm holding on to it for a little while until I figure out what to do with it. I still have two finished quilt tops and two more quilts in the works, but I'm making a dent in my fabric stash and that makes me happy. Now to make a dent in my scrapbooking stash....yeah, that will take years. You are amazing! I love how you share your talents! Love the quilting! You are so talented. Wow! You are so talented! Such a beautiful quilt! I LOVE the way it turned out too! Great job! holly, its stunning! just love it! Love the squiggly lines! And thanks for sharing the pattern, been looking for some new quilt ideas. Will go check those out! Yours is absolutely beautiful! !